I have some rods that are different colours and different lengths. 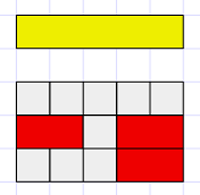 Can you find all the ways to match the yellow rod using reds and whites? How will you know that you haven't missed any out? You could use the interactivity below to try out your ideas, or you could use our Cuisenaire Environment. The dark green rod is longer than the yellow rod. Can you find all the ways of matching the dark green rod using white and red rods? Why not use the interactivity below to find all the ways of matching the dark green rod, or again, you could use our Cuisenaire Environment. Working systematically. Practical Activity. Investigations. Combinations. Interactivities. Games. Addition & subtraction. Cuisenaire rods. Compound transformations. Visualising.